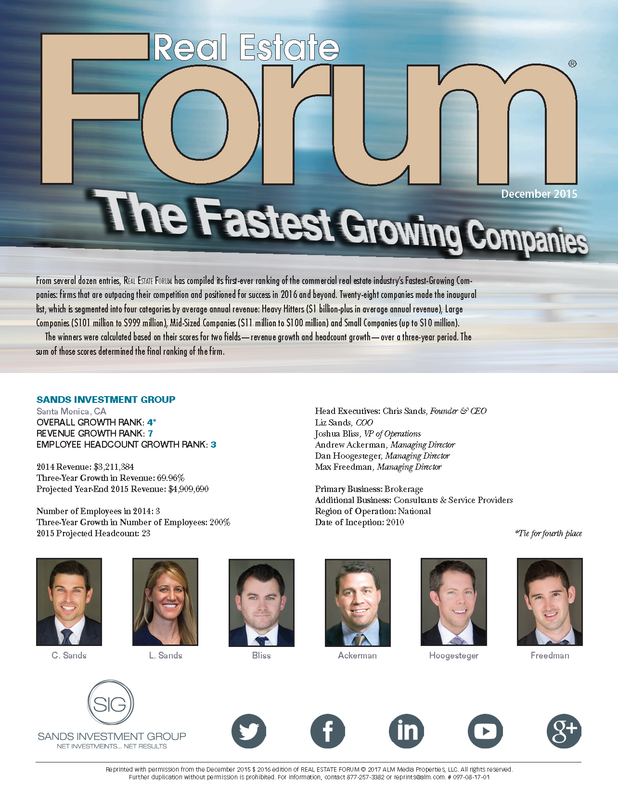 SANTA MONICA, CA (January 2016) — In its December 2015 issue, Real Estate Forum magazine named Sands Investment Group (SIG) to its first-ever ranking of the commercial real estate industry’s fastest-growing companies. According to Real Estate Forum the list recognizes firms that are outpacing their competition and positioned for success in 2016 and beyond. Twenty-eight companies made the inaugural list. Winners were calculated based on their scores for two fields including revenue growth and headcount growth. Sands Investment Group, was the top ranked net lease firm. Founded in Santa Monica, CA, SIG cited a three-year growth in employees of 200 percent and a three-year growth in revenue of 70 percent.